The townhouses at 70-76 Temple Street in Springfield, around 1938-1939. Image courtesy of the Springfield Preservation Trust. Unlike many other large cities in the northeast, Springfield never saw large-scale development of townhouses during the 19th century, with residents preferring detached single-family homes on larger lots. However, there were some townhouses that were built throughout the downtown area, including this block of four houses on Temple Street, which was completed in 1874. The houses are among the city’s finest surviving examples of High Victorian Gothic architecture, and they were designed by local architect George E. Potter, whose other works included the six townhouses at the corner of Maple and Central Streets. Temple Street itself was developed in the 1870s, on land that had previously belonged to the prominent Morris family, including probate judge Oliver B. Morris and his son George B. Morris, who served as the Clerk of Courts for many years. However, Oliver died in 1871, followed by George a year later, and within a few years George’s son Robert had opened Temple Street through the property. This townhouse block was among the first buildings to be developed on the street, and was constructed at a cost of about $32,000 for the four homes, or about $700,000 today. The houses were numbered 70, 72, 74, and 76 Temple Street, starting with 70 on the far right. They were jointly owned by Robert Morris and William S. Shurtleff, with Morris living at number 72 and Shurtleff at number 74. Morris had become the Clerk of Courts after his father’s death in 1872, and served in that position until his own death in 1925. 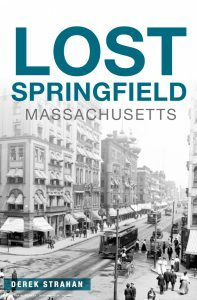 Along with this, he was also a directory of the United Electric Light Company and president of the Springfield Five Cents Savings Bank, and in 1901 he published a book, The Birds of Springfield and Vicinity. He and his wife Lizzie lived here in this townhouse for many years, although around 1912 they moved a short distance to the east of here, to a house at 82 Temple Street. William S. Shurtleff was also a longtime resident of this townhouse block, living at 74 Temple Street until the early 1890s. Shurtleff had served in the Civil War, enlisting as a private but ending up as a colonel. In 1863, he was appointed Judge of Probate and Insolvency, and served on the bench for the next 33 years, until his death in 1896. He also served several terms on the city’s Common Council, and was also the vice president of the state Board of Public Reservations, a founder and vice president of the Connecticut Valley Historical Society, and a director of the City Library Association. During the 1880 census, he was living here with his wife Clara and their daughter Mabel, plus his niece Clara, his brother Roswell, Roswell’s wife Sarah, and two servants. 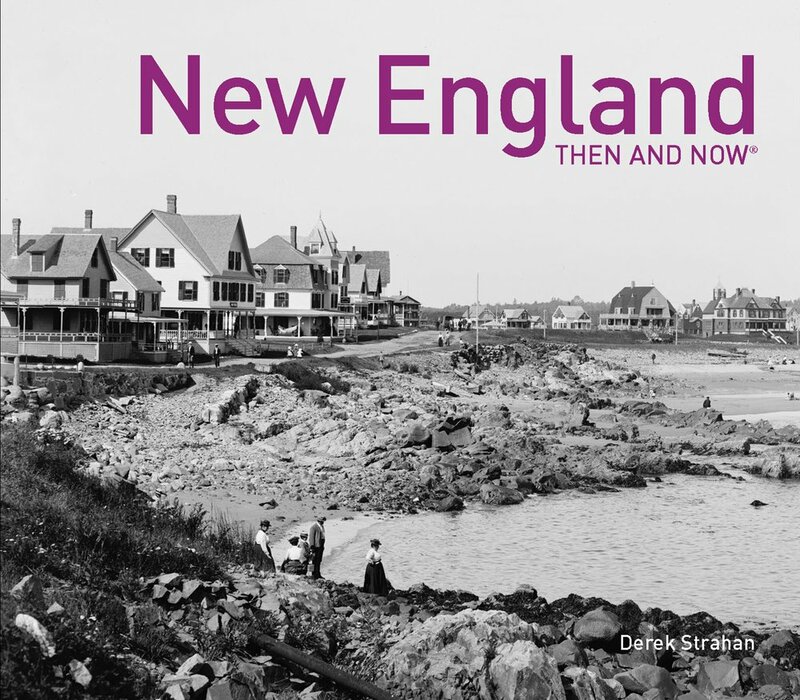 Although designed as upscale single-family homes, this began to change by the turn of the 20th century. During the 1900 census, Morris’s house was the only one still occupied by a single family, with the other three having been converted into boarding houses. The most crowded of these was 74 Temple, which had three residents, along with a servant and six boarders living here. The subsequent 1910 and 1920 censuses show fewer numbers of boarders in these houses, although this would change dramatically by 1930, perhaps as a result of the Great Depression. During that year, there were eight lodgers in number 70, eleven in number 72, thirteen in number 74, and eight in 76. These residents included a variety of middle class workers, such as a pharmacy clerk, a waitress, a factory inspector, an auto mechanic, several teachers, a chauffeur, an accountant, a traveling salesman, and a milkman. The first photo was taken later in the decade, only a few years before the 1940 census. By this point, the townhouses were still in use as boarding houses, with similar numbers of residents. As was the case in 1930, the residents held a variety of jobs, and nearly all of them earned under $1,000 a year, or under $18,000 today. By the time the first photo was taken, there was also another building attached to this block, just to the right of 70 Temple Street. This building first appears in city atlases in 1899, and had a plain brick exterior that contrasted sharply with the much more ornate Gothic townhouses that adjoined it. It was numbered 66-68 Temple Street, and during the 1940 census it housed four apartment units in number 66, plus a boarding house with six tenants in number 68. Today, this addition on the right side is gone, having been demolished sometime in the second half of the 20th century. 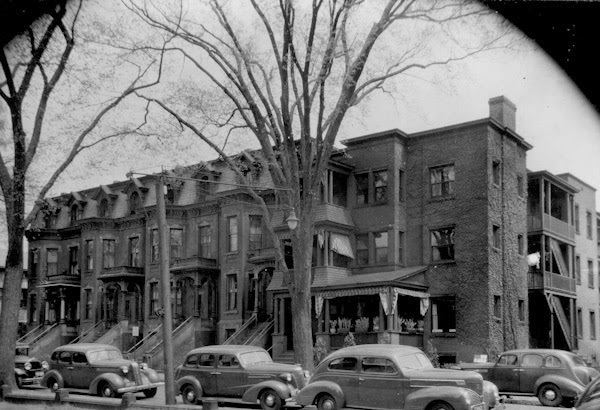 However, the four original townhouses are still standing, with well-preserved exteriors that have seen few changes since the first photo was taken. The interiors, though, have undergone substantial renovations over the years. The houses had started as single-family homes, before becoming boarding houses, and they are now divided into condominiums, with four units in each of the four houses. 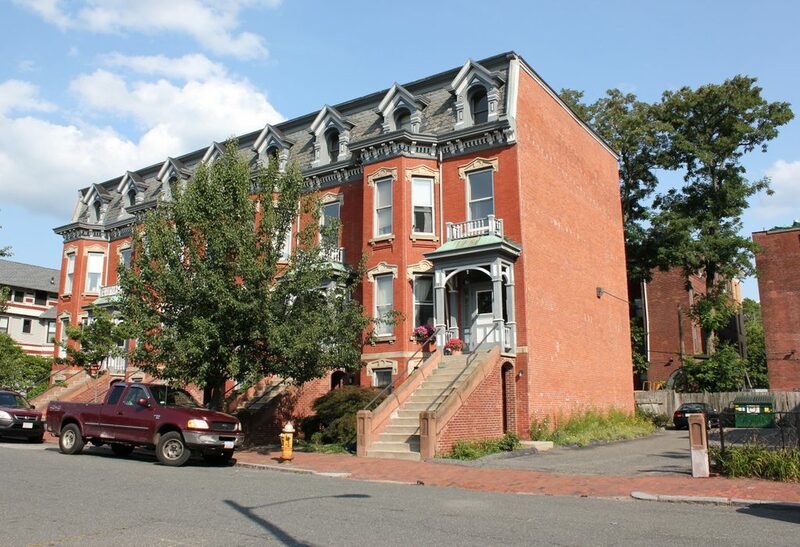 Like the Classical High School directly across the street, they are one of a number of historic properties in Springfield that have been converted into condominiums, and today this block of townhouses is part of the city’s Lower Maple Local Historic District.